If clutter is taking over your space, then it’s high time to get your home in order. 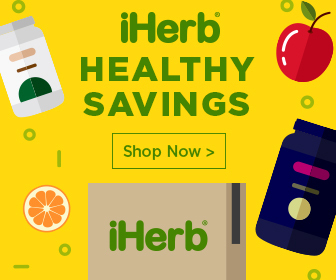 It will help you be more productive, and keep you more inspired too. 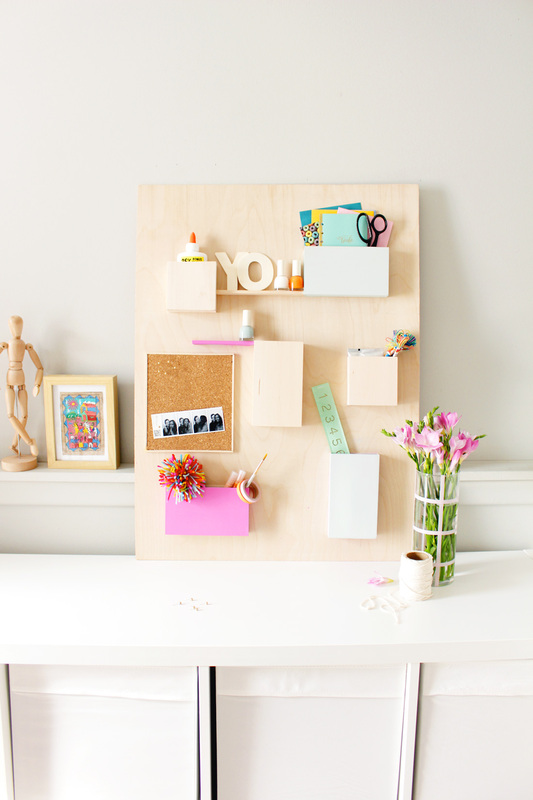 And it doesn’t have to cost a fortune – here are 25 wonderful DIY projects that will help you get organized. 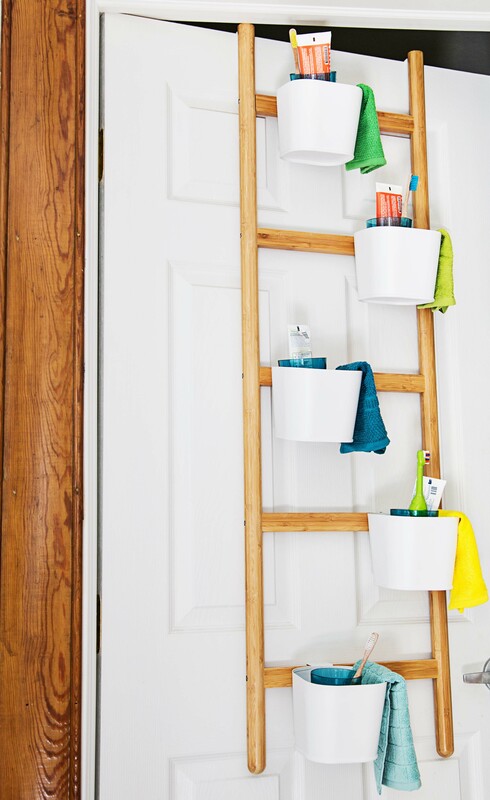 If you lack storage space, you might consider making one of these genius organizers that hangs on the wall to take advantage of vertical space. It’s modeled after a product from Anthropology, so of course it’s super stylish! Get the tutorial at Fish & Bull. Hide all of those unsightly remotes and old magazines under your sofa on this clever rolling storage tray. All you’ll need is some wood, nails, glue and four wheels. Make your way over to Passion Shake to check out all of the details of this simple project. 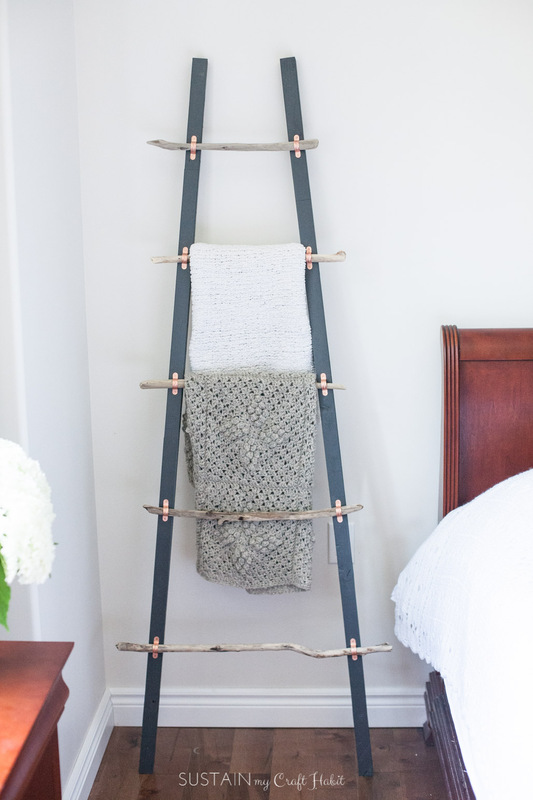 If you have way too many throw blankets, then you’re sure to love this beautiful DIY blanket ladder. The combination of the driftwood rungs with the blue and copper gives it a beautiful, high-end look. Check out the full tutorial over at Sustain My Craft Habit. 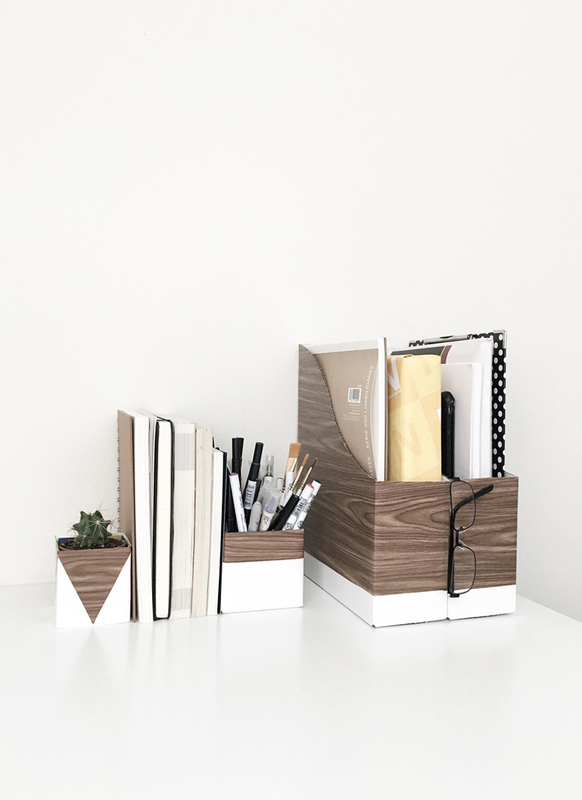 If your desk is a disaster, it’s time to get things in order with a few of these gorgeous wood and white organizers. All you’ll need are some white boxes and a roll of wood contact paper. Head on over to Drawn To DIY to check out the instructions for this clever project. Everybody has that spot… where they toss their keys, spare change and maybe a pair of sunglasses. Why not contain it in something so it looks more organized? This leather catchall would be the perfect solution. Check out the tutorial at DIY In PDX. If you have kids who struggle with the process of going to bed, then you’ll want to check out this genius IKEA hack. It is actually the SATSUMAS plant stand, and the white pots come with it. Head over to A Beautiful Mess to check out all the details. 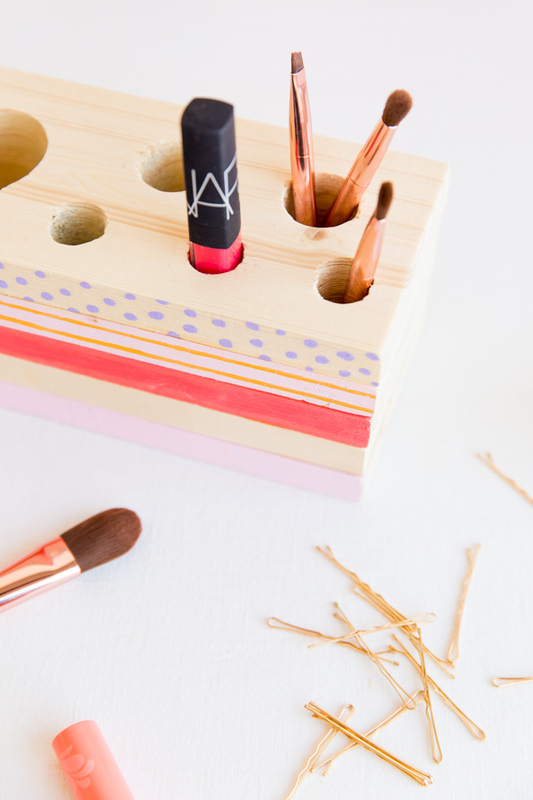 Get your makeup brushes and lip gloss in order with this fun and easy DIY cosmetics organizer made of wood. Simply drill holes down into it and then decorate the outside with acrylic paint. Head on over to Paper N’ Stitch to check out the full tutorial. 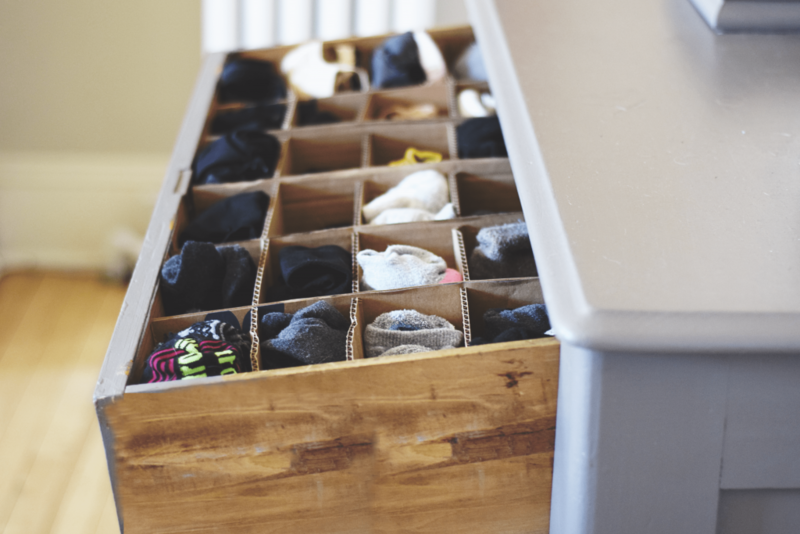 If your clothing drawers are a mess, then this clever organizer might be the perfect project for you. It is made out of cardboard, and the sizes of the sections can be customized to your needs. Check out the tutorial over at Adventures of a Creative Girl. 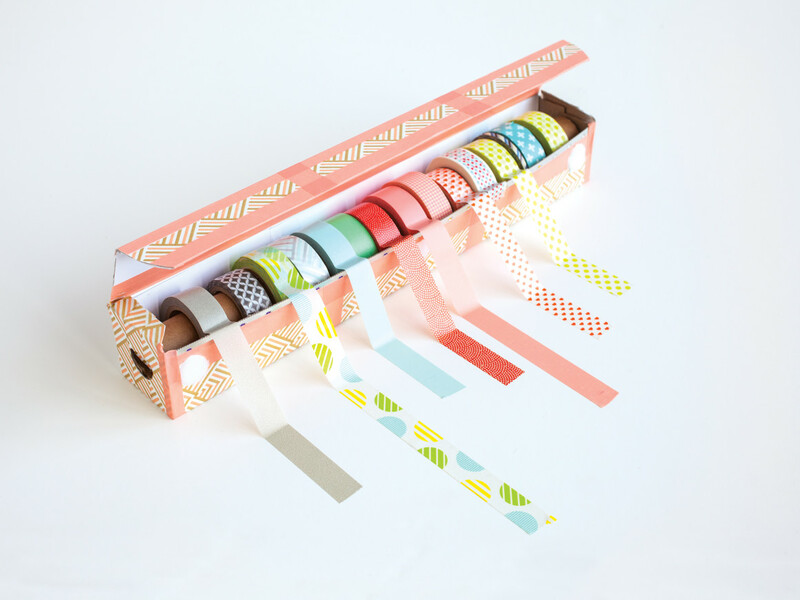 If your washi tape situation has gotten out of hand, give this easy yet genius organizer a try. Simply upcycle an old plastic wrap or tin foil box and slide the rolls of washi onto the tube. And don’t forget to decorate the outside with tape too! Learn more at Hello Creative Family. Are you a big fan of stacking rings? Then you probably have a whole mess of them. 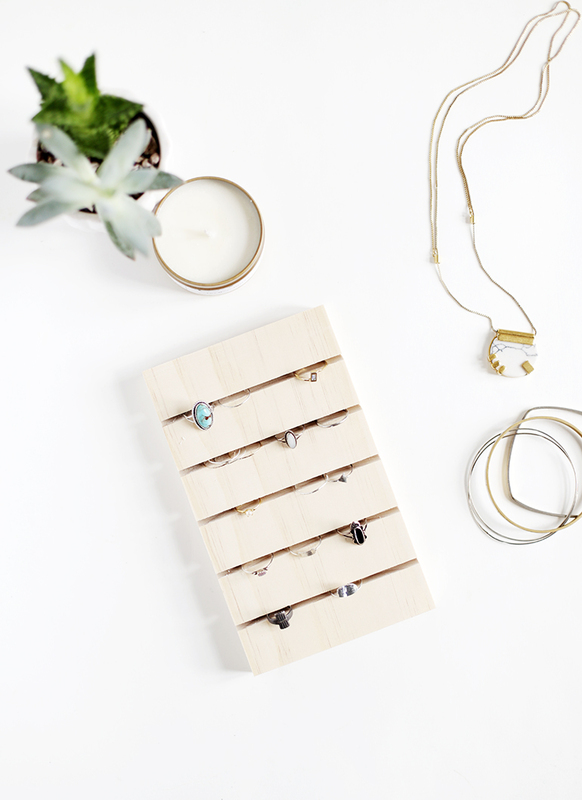 Organize your jewelry drawer by making one of these simple wooden holders. Just make slits in a piece of wood and you’re done! Head over to The Merrythought to see the instructions. 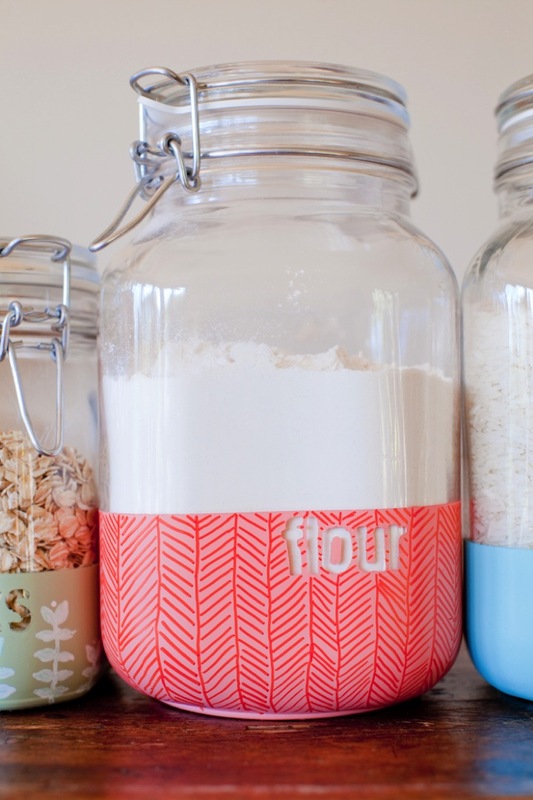 Whip your pantry into shape with these fun color-dipped jars that you can fill with dry goods like flour and rice. All you’ll need are some adhesive letters, paint, and a couple of other items. Head on over to This Little Street to check out the instructions. If you ever order things online, then you probably have a few cardboard boxes laying around. 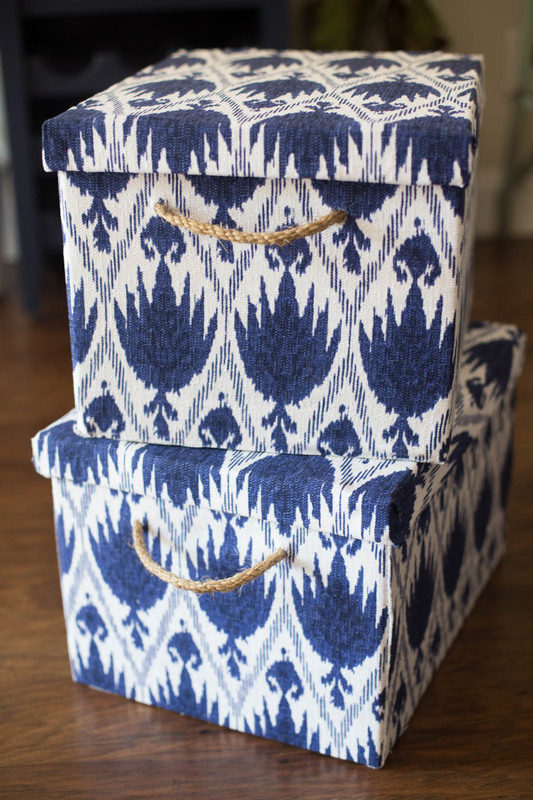 Well there’s good news… you can upcycle them by turning them into pretty baskets! Make your way over to Elizabeth Joan Designs to find out all the details of this clever project. 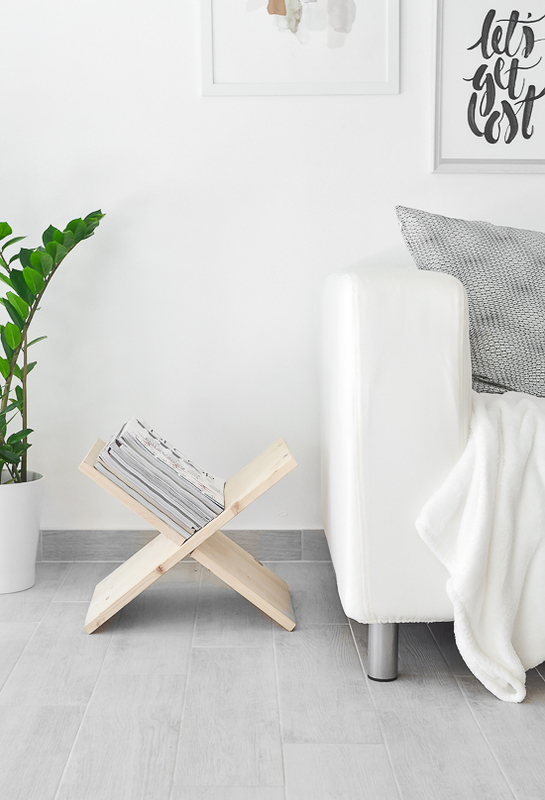 Get your magazines organized this season by creating one of these lovely understated X-shaped magazine racks. All you’ll need is some wood and a saw. Make your way over to Homedit to find how to make your own clever (and easy!) X-shaped magazine holder. This is one of those “why didn’t I think of that?” sort of projects. 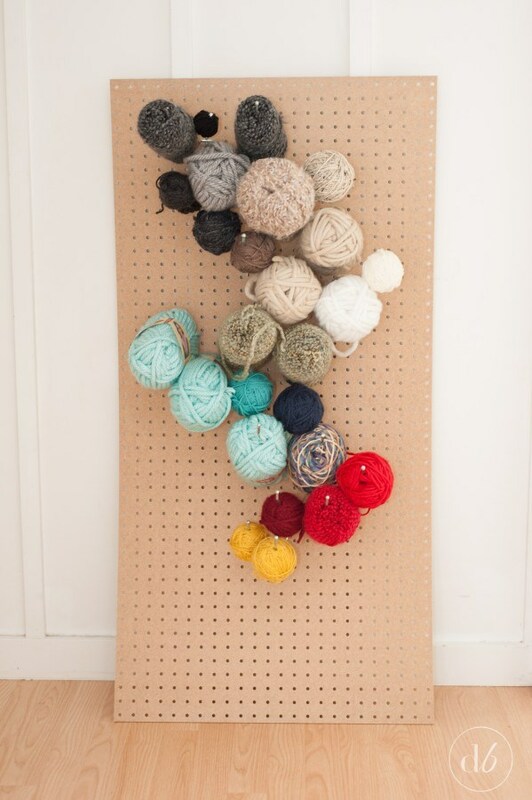 If you have lots of yarn that is always in the way, just grab some pegboard and hooks at the hardware store and you’ll be ready to make this genius organizer. Check out the details at Dwell Beautiful. 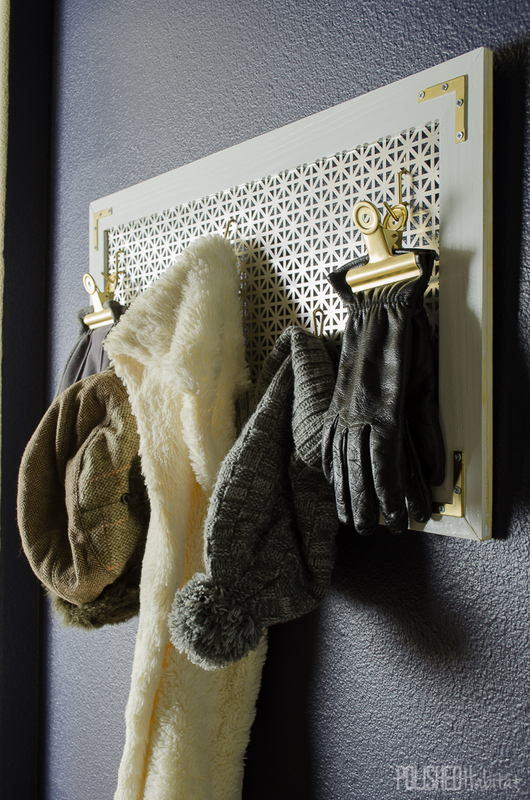 Step up your entryway game with this lovely coat rack that looks beautiful even on its own. The back is made with a metal radiator cover, and framed with wood. Make your way over to Polished Habitat to check out the instructions and lots more photos. 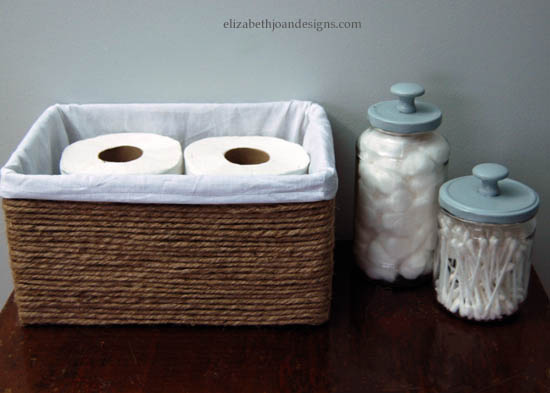 If you are in need of some bathroom storage, you might consider this fun project. 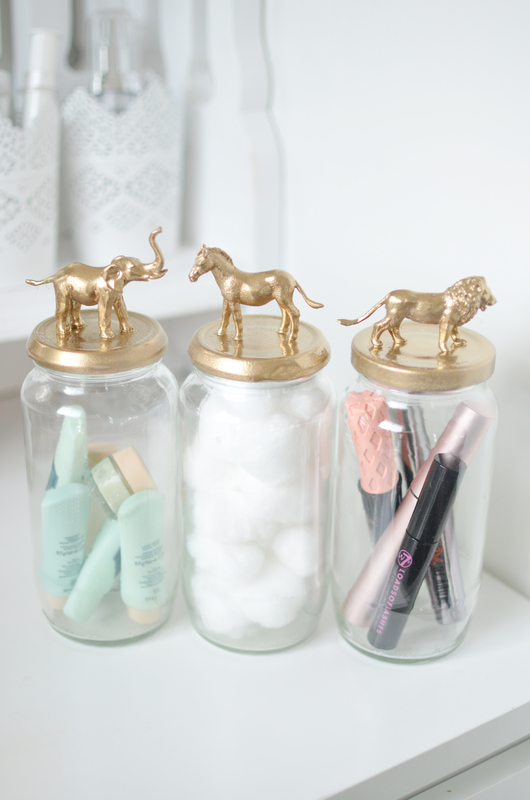 The animals added to the top of recycled jars add a playful touch, making even your bathroom memorable. Head on over to Bang On Style to check out the full tutorial. 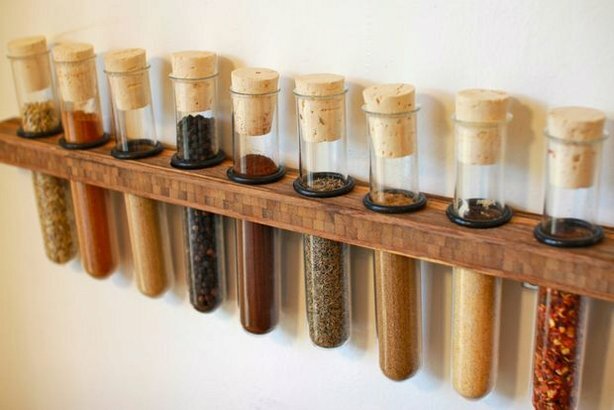 Toss those ugly plastic containers that your spices come in and transfer them to something cooler – test tubes! This particular test tube holder is well-mounted too, so it will open up some serious cabinet space. Head over to Instructables to check out the how-to. Here’s another clever way to upcycle all of those cardboard boxes that you inevitably keep receiving. Simply grab some pretty fabric, rope and spray adhesive and get to work using this tutorial from Making Home Base. Your friends will never know your secret! Tossing a pile of keys by the door can look sloppy, but there’s an easy way to avoid this problem. 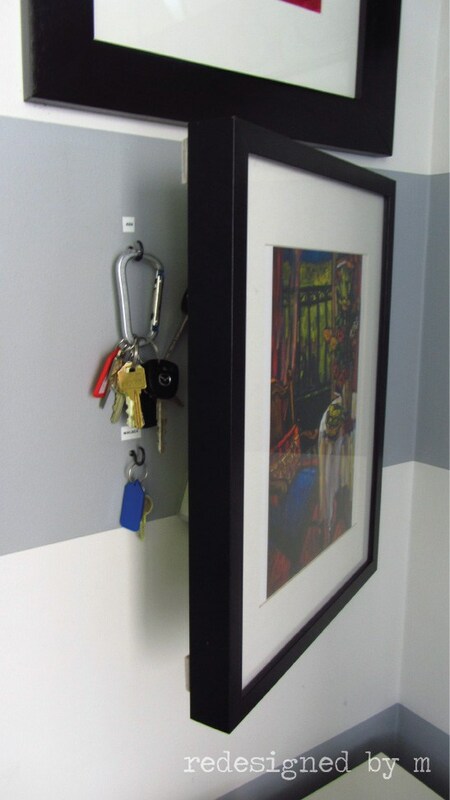 Simply mount a picture frame along one side using hinges, and you’ll have the perfect spot to hide the mess! Head on over to Planq Studio to check it out. Isn’t it annoying when you try to find something in your pantry or corner cupboard, and you can’t reach it because it’s all the way in the back? Here’s the genius solution – install a series of Lazy Susan trays in each corner so you can spin them around to reach the back. Read more here. 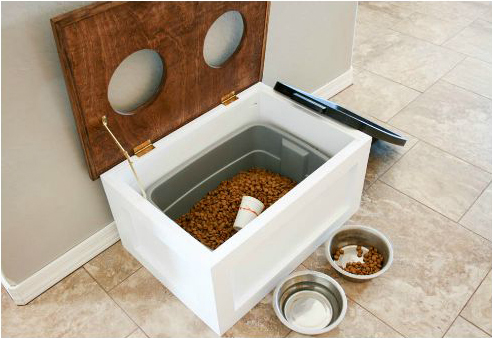 If you have a furry friend, then you might be interested in this clever DIY dog food eating station with a storage area below. The box raises Fido’s food up to his level, and also gets his spare food out of the pantry (which frees up space for other things). Get the how-to here. 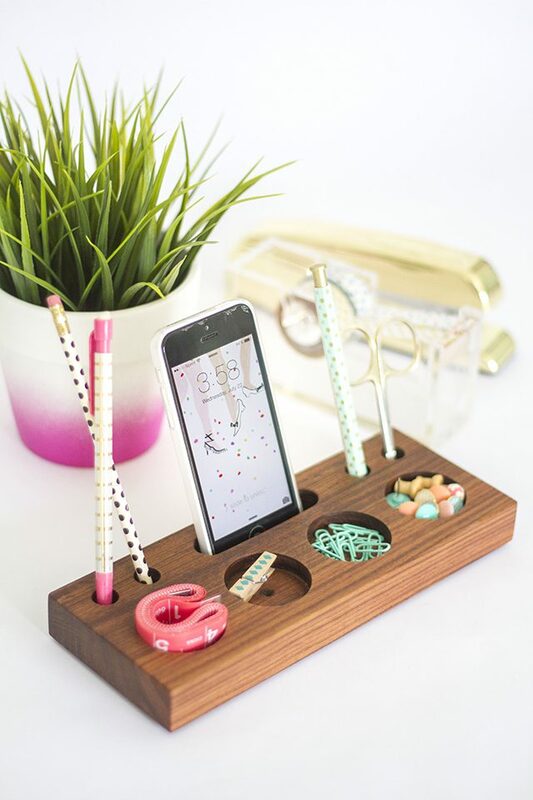 Tackle that desk clutter with this simple-to-make desk caddy with sections for your phone, writing utensils and paper clips. All you’ll need is some wood, stain and a few tools. 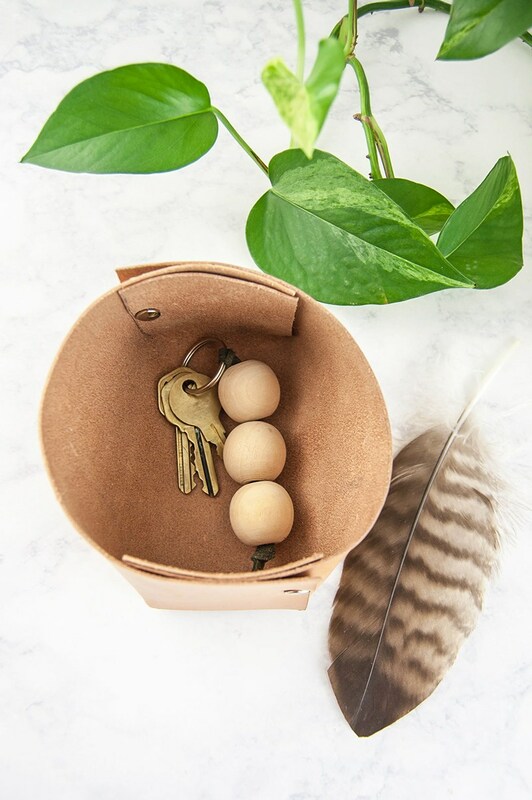 Make your way over to eHow to check out the instructions for this fun organizer. 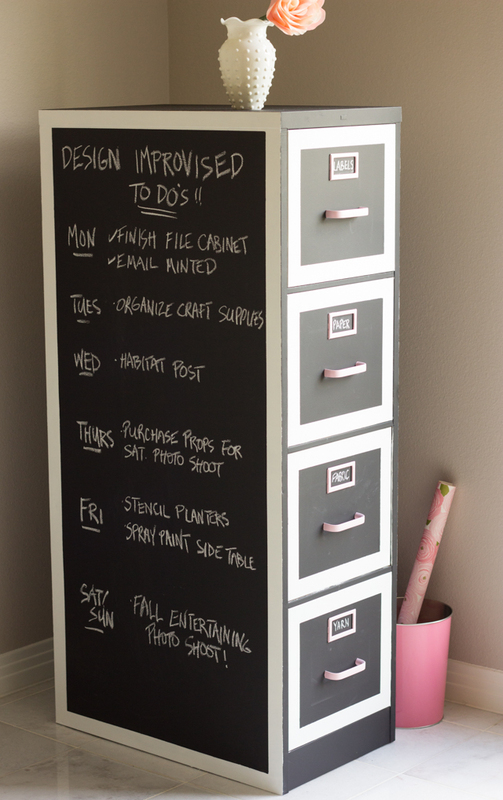 Transform a boring old filing cabinet into this super fun version using chalk board paint. Just grab some metal primer, chalk board paint, and a contrasting paint for the hardware. Head on over to Design Improvised to check out the full tutorial. 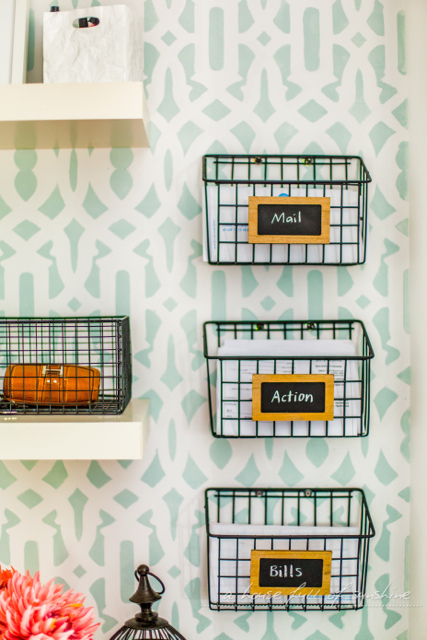 Get that paperwork under control by making one of these handy command centers which will help you keep mail, bills and action items all in order. Just grab some wire baskets and get to work. Check out the instructions over at A House Full of Sunshine. 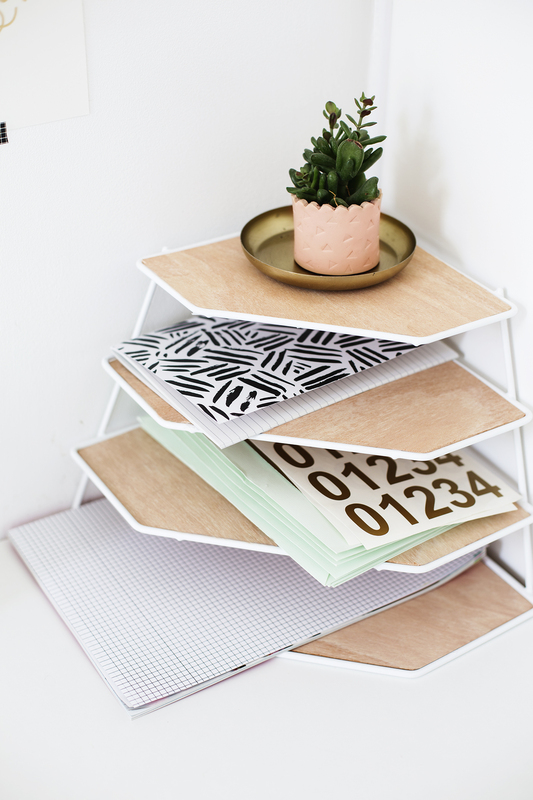 Wrangle all those notebooks into one neat little pile, with the help of this balsa wood desk organizer. You’ll begin with a pan organizer, believe it or not, and then add balsa wood to create neat little shelves. Head on over to The Lovely Drawer to check out the tutorial. The post 25 Clever DIY Organization Ideas appeared first on DIYs.com.